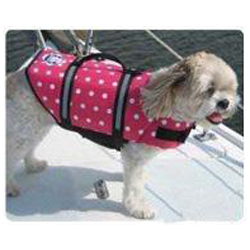 Are you looking for the best large dog life jacket? If so, this article consolidates all of our recent research and recommends the best to choose from. For the sake of clarity, when we say a large dog we’re thinking of a dog such as a Golden Retriever, a Doberman Pinscher, a Great Danne, or a Labrador Retriever. When it comes to buying a new life jacket, it is important to focus on the dogs freedom of movement, and the strap placement. These are also the most difficult items to evaluate online (which is probably why you are reading this post!). 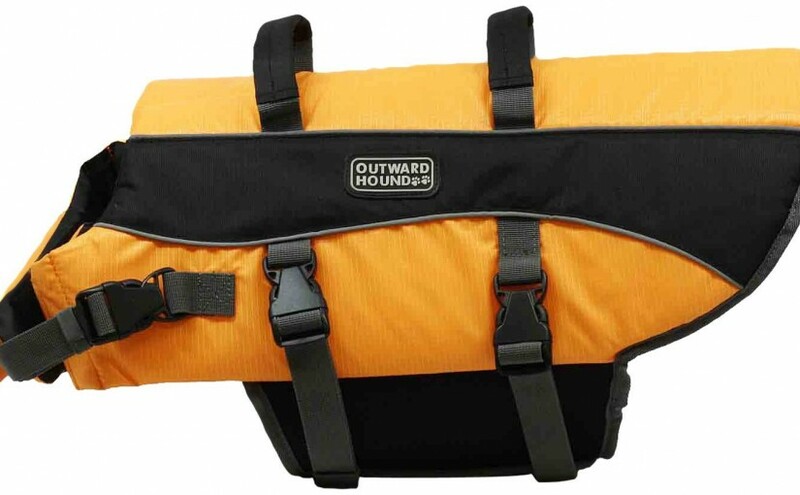 My primary recommendation for a large dog life jacket is almost always going to be the Kyjen Outward Hound. Not only is it affordable, at about $28 (depending on size), but it’s durable and comes in a number of sizes for virtually any dog. There’s a XL size for dogs with a girth of 33-40 inches. I’ve seen sale prices on Amazon that have the XL size at only $12! A couple of the convenient features of the Kyjen dog life jacket are a sweet grab-handle. Awesome if your dog is swimming alongside your kayak and you need to reach down to pull him/her out of the water easily. This life vest comes in a number of sizes. Please see the attached chart showing the sizing. Get the extra large (XL) size if your dog is between 70-90 lbs. (and has a girth of 31-42 inches). Go for the large (L) size if your dog is between 40-65 lbs. (and has a girth of 28-32 inches). You’ll want the medium (M) size if your dog is 20-40 lbs. (and has a girth of 21-27 inches). If you need a smaller size, then you’ll probably want to check the smaller sizes that are available. If you are unsure about the correct size, you can check the customer questions and answers section on Amazon. There are lots of answered questions where you can learn from what people are saying. For example, if you have a French Bulldog, which is about 22 lbs, people suggest the medium size. Another customer with a 60 pound Lab/Shepherd mix got the large size and was completely happy. One more customer had an American Bull Dog that weighed 87 lbs. and they said they got a XL size life jacket and it worked out great. I’ve seen that the XL size also works great for 75-80 pound Airedale dogs, as well as Pitbull dogs. So, which size should you get? Definitely go bigger if your dog is on the upper end of one of the weight or dimension limits. The straps will allow for any size-down as needed. A large size fits a 50 lb. dog almost perfectly. If you are watching reviews online, you’ll want to know that in 2014 the company revised their recommended measurements. Prior to this, lots of people were complaining that the sizing was too small. I think the newer measurements are much better. It’s better to determine the correct size by measuring the girth of your dogs chest (rather than by trying to guess on the weight). You’ll want to review some of the pictures of the product, but what you’ll notice is there are flats that wrap around your dogs chest. So, with the straps it’s highly configurable. 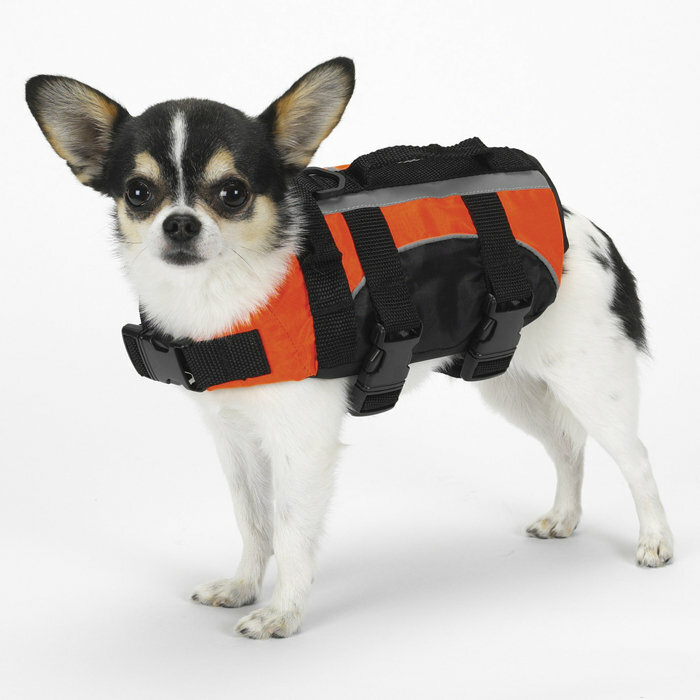 Overall, this life jacket is perfect for any size dog! It works for the smallest little dogs (XXS size available) or for larger 85+ lbs. dogs! 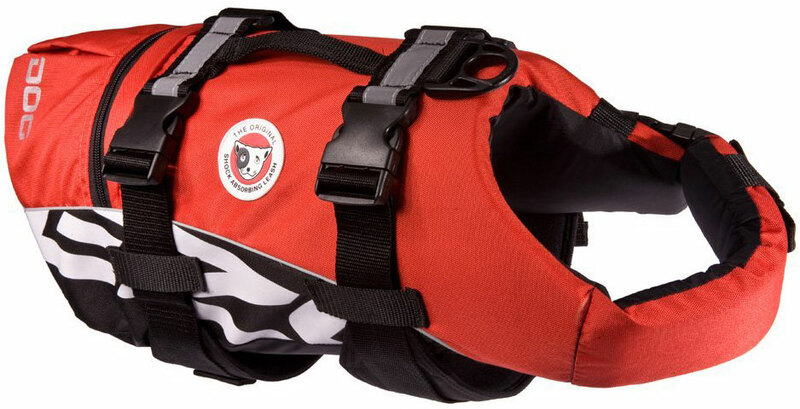 The life jacket will give you peace of mind, and help your dog swim better in any condition! 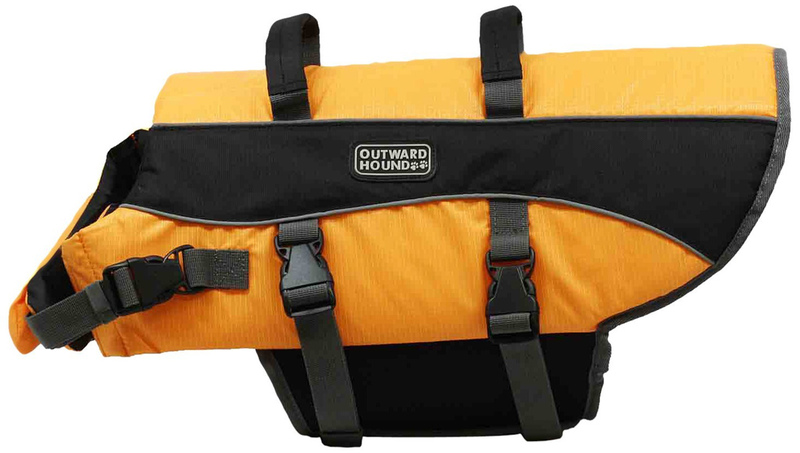 In addition, the Kyjen Outward Hound Life Jacket has a 4.5 star average rating on Amazon (out of over a thousand reviews). 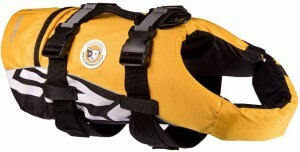 For about $21-23 you can purchase the large or extra-large size of the Paws Aboard Doggy Life Jacket. 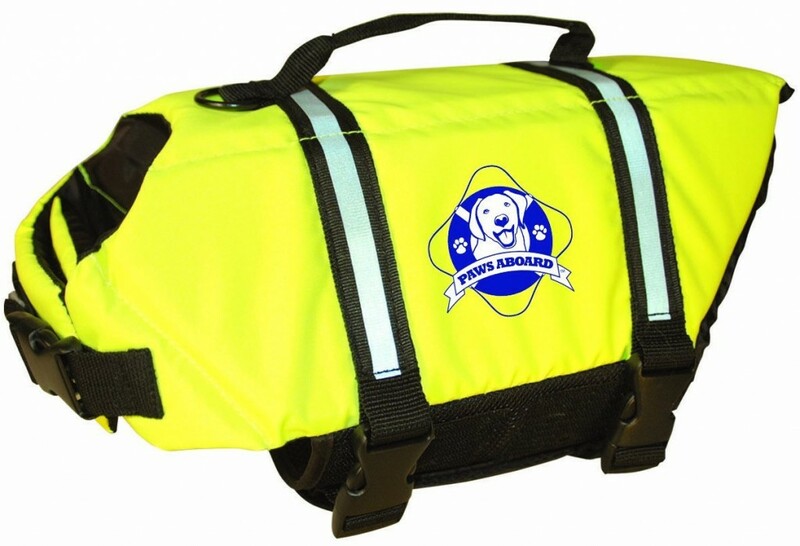 This life jacket for dogs comes in a bright neon yellow color. You certainly won’t misplace your dog! Some vendors sell the XL size for about $45, so shop around! 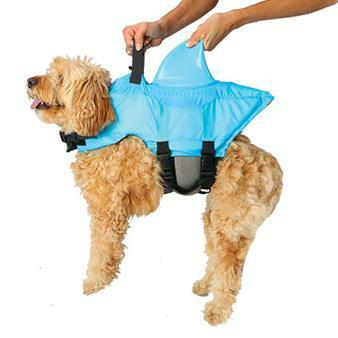 The manufacturer is called Fido Pet Products and they make six different styles of this life jacket, but they are not all sold online. The sizing of the neon yellow variety is what we’ll focus on in this review. 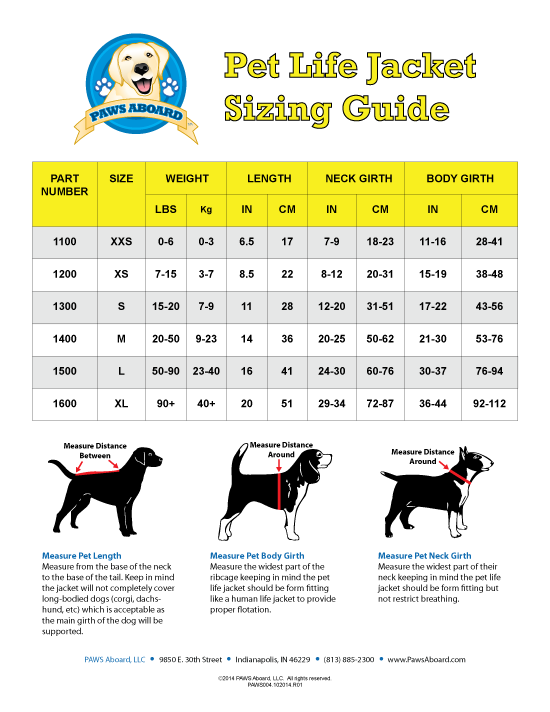 Please review the sizing PDF chart for this particular product before ordering. 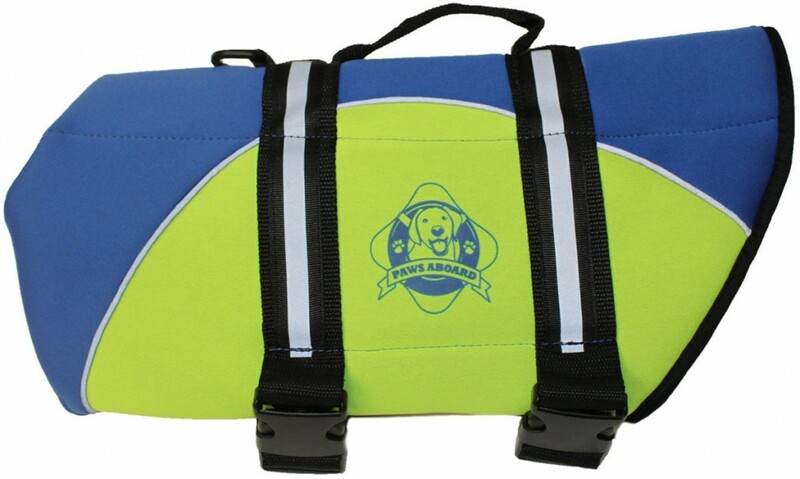 Also by the same company as above, is the Paws Aboard Neoprene Doggy Life Jacket which sports a two-tone design of blue and yellow. This large dog life jacket provides buoyancy and high visibility for pet safety in the ocean, on lakes, or on a river. 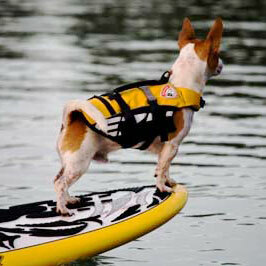 The EzyDog product is by far one of the most popular dog life jackets available. The company basically only makes one type of vest that they sell in a variety of sizes. They are The Doggy Flotation Vest (comes in 5 sizes for medium to large dogs) and the Micro Doggy Flotation Device (comes in 3 sizes for smaller dogs under 15 lbs.). This life vest comes in either yellow or orange. The options for a large dog are as follows: The medium size is designed for a 40-60 lb. dog with a girth of 25-39″ and a length of 15-20″. The large size is for 60-90 lb. dogs which have a girth of 27-44″ and a length of 17-24″. And lastly, the XL size is for dogs over 90 lbs. that have a girth of 30-48″ and a length of between 20-26″. The straps are adjustable, so if your dog is borderline some times it is safer to order the next larger size because you can tighten the neoprene straps quite a bit. 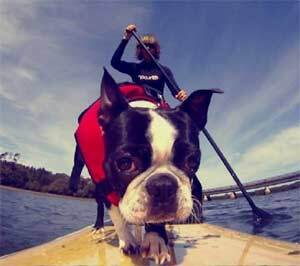 We like the grab handle on this dog life jacket the most of all of the options out there. It’s a really nice looking design with easily adjustable straps. 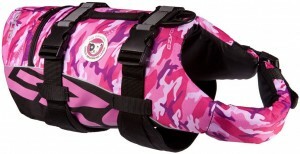 This is a well designed life jacket because of the snug fit. It usually fits great on dogs and allows for a full range of movement. Plus, we like the handle on the top better than comparable models. Which one is best Large Dog Life Jacket? I recommend The Doggy Flotation Vest. It’s my personal favorite of every large dog life jacket I have found available. Dogs love it, and it fits snug. About the author: I’m Chris, and let me tell you about one of the biggest dogs I’ve ever owned. He was a Shar-Pei / Boxer mix — one of the friendliest dogs I’ve owned, but truthfully it kind of scared me a little because my uncle had raised it as a tough dog and it had been injured in the head at some point (a wild burro kicked it!). This was a big dog, capable of jumping up onto the top of our 6 foot tall block fence and over into the neighbors yard. But, this dog was tons of fun to go exploring with, and was a really fast runner. If he got off his leash, he would be gone in a minute — and difficult to catch! His name was Hughie, and he would sleep at the foot of my bed. So, which one should you get? Large Dog Life Jacket’s can be tricky to buy. Please stay tuned, as I’ll be reviewing more dog life vests as I come across them. It would not be an exaggeration to call the EZYDog doggy flotation device a true lifesaver. The product’s durable materials and different sizes and colors to choose from make it a perfect fit for any canine companion. Anyone looking to keep their water-loving pups safe and sound should not hesitate to put this jacket to the test. While it may be higher on the price scale than other dog life jackets, rest assured this product is made with quality materials. Rest easy with the knowledge that your dog will benefit from the absolute highest degree of safety available. This product combines the utmost functionality with comfort. 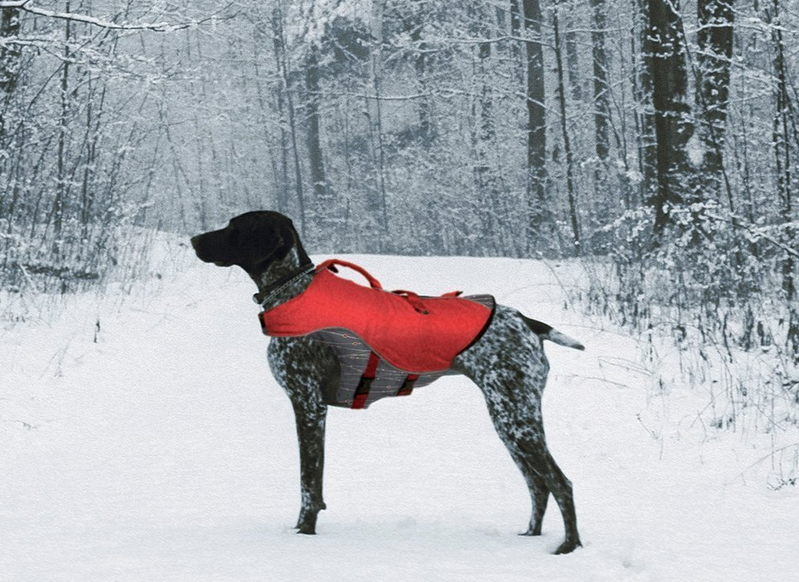 The strong handle and straps keep the vest snugly secure at all times and in all situations, and dog owners will never have to worry about it slipping off or wearing out. The vest itself does its job remarkably well, using ultra-buoyant material to easily stay afloat with even the largest dogs. Most surprising is that while doing all this, it remains extremely comfortable and allows for a great degree of freedom of movement, both for human hands as well as canine bodies. The EzyDog doggy flotation device comes in five different sizes from XS to XL. That should work for most dogs ranging from 15 to 90+ pounds. 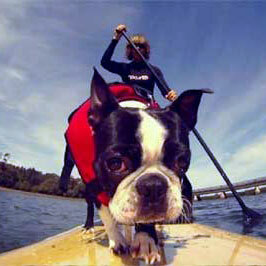 If you need an even smaller life jacket, consider the EzyDog Micro version which is for dogs under 15 pounds. Refer to the chart below for sizing information. It’s important to note that we recommend measuring your dog before ordering. Many times, people will order a size smaller if they are on the edge of one of the dimensions. But, we recommend the opposite! Order one size larger, if you can, because you can cinch up the straps and make for a better fit. There is an assortment of colors and designs to choose between, from a standard red and yellow to pink and green camo print. Each of these choices gives high visibility for a water bound dog and they all have their own attractive characteristics. It would be preferable if the designs came in an even wider variety of colors, but the nature of the product requires brighter tones for safety purposes. It should be pointed out that the EzyDog doggy flotation device uses about 50% more flotation material than some of the other dog life jackets. This is important for longer swims, where your dog may grow tired. One consideration is that this product is priced somewhat higher than other options on the market. A bit of research will turn up alternatives as low as $30, although one might not be as confident in any of these jackets’ durability or proven effectiveness. Dog owners will rest more easily knowing that they chose to invest in one of the best canine life vests that money can buy. At the end of the day, the bit of extra cash is more than a worthwhile investment, knowing that your dog will be safe wherever she goes. 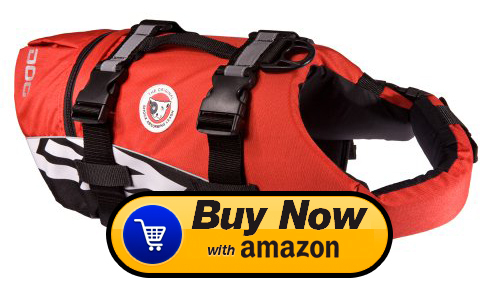 The EzyDog life jacket is available through Amazon and other sellers. Once you’ve made your purchase, and tried it on your dog, please report back here and let me know what you think and what size you ordered. It would be helpful for others who are trying to figure out what size jacket to order.